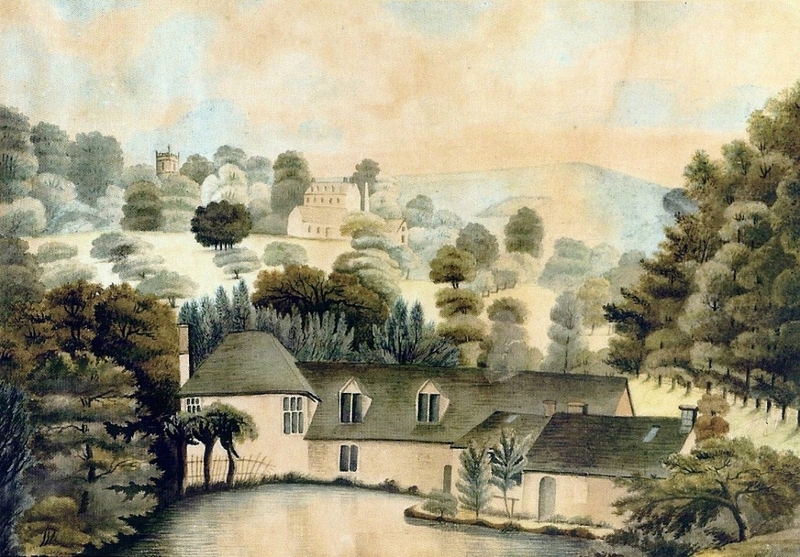 Spillman’s Court was latterly a nineteenth century mansion that burned down in 1902, located between Lower and Middle Spillmans bordered by Rodborough Hill. This was probably on the site of a medieval farmhouse. 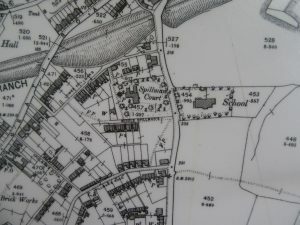 The Spilmon family were first recorded as landholders in 1170 and were succeeded by the Payne and Halliday families in owning fields between Walkley Hill and the river. 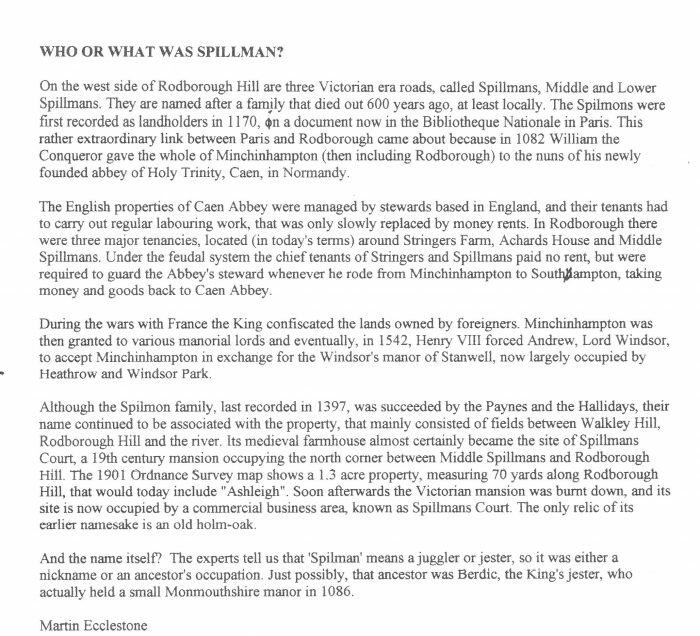 (Information written by the late Martin Ecclestone) – full details below: It is unfortunate that no close up pictures or drawings have been found showing the house. However the postcard image below, produced by the Stroudwater Textile Trust shows Badbrook Mill c1810 and the building in the middle background is said to be Spillman’s Court. 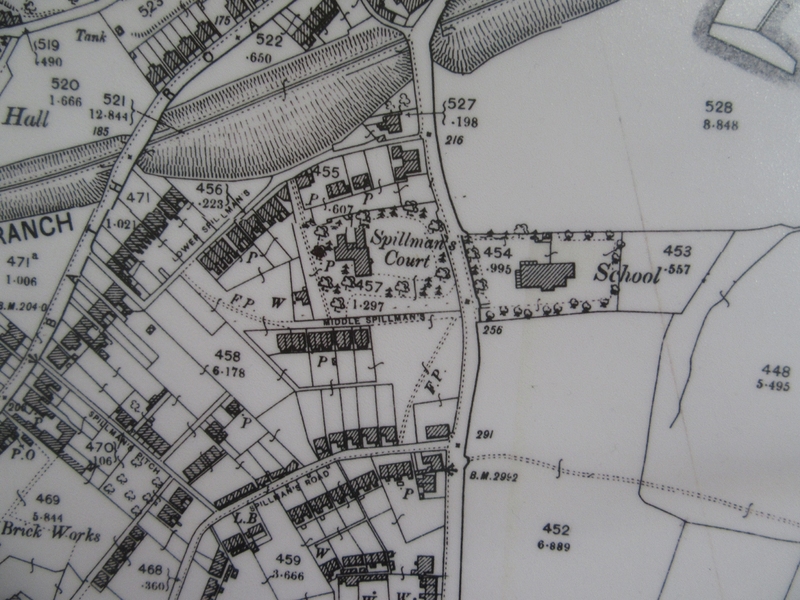 The 1839 map (available to view in Stroud Library) shows the building as Spillman’s House with Spillman’s Court Orchard extending up to the line of the later Spillman’s Road. The 1871 census shows Spillman’s Court as a private school run by Richard Hutchins, a clergyman. At that time there were 8 boys, aged 10 to 17, in residence as pupils. 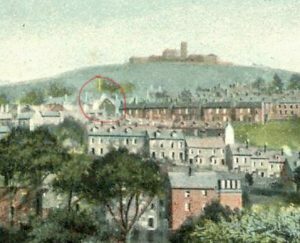 The Fire that destroyed the building is described in the Stroud News of 31st January 1902. It appeared to begin as a chimney fire, the origin of which is unknown; there was a suggestion that it was started by a trespassing tramp. The house that had been untenanted for many years, the last occupant being a Mr W. Foster. (The 1881 census lists the property as Spillman’s Court Nursery, occupied by William Foster and his wife Augusta, four children and a domestic servant. William was a nurseryman, employing five men and 2 boys. The Fosters, William as nurseryman, were still there in 1891 with seven children. 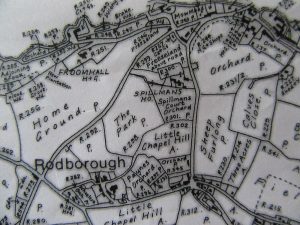 In 1901 the property is recorded as unoccupied). There was a vague rumour that it was haunted. The caretaker was a Mr Bates the local town-crier and bill-poster, who used the land and outbuildings to keep poultry and a cow. Reports intimated that the Liberal party had acquired the building with the intention of using it as a Club and Recreation Room. It was built in the old-fashioned style, with massive oak beams, carved wooden mantelpieces and artistic heavy panelling, all of which fed the fire… Internal window shutters are also mentioned. By the time the fire brigade arrived the top floor was well-alight and the roof had fallen in. 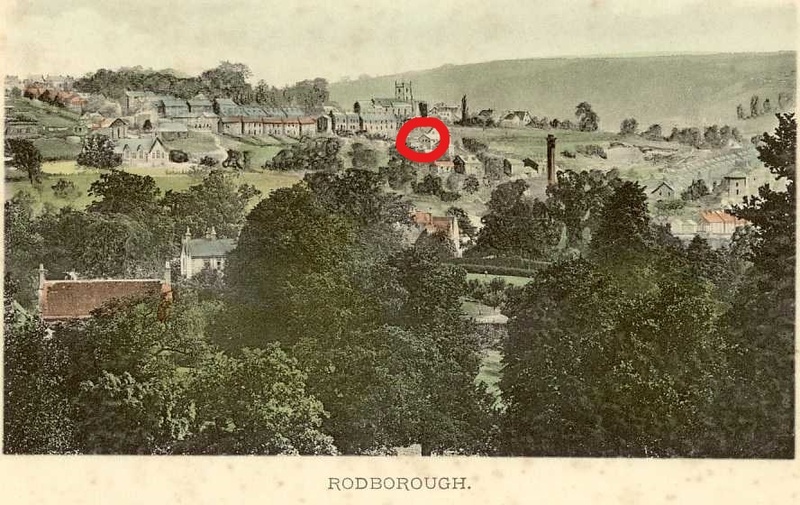 Water was pumped from the brook and reservoir at Fromebridge Mill but efforts were hampered by a lack of water and it was impossible to save the lower building; by the end only four walls without windows or frames remained. The damage was estimated at £3000. 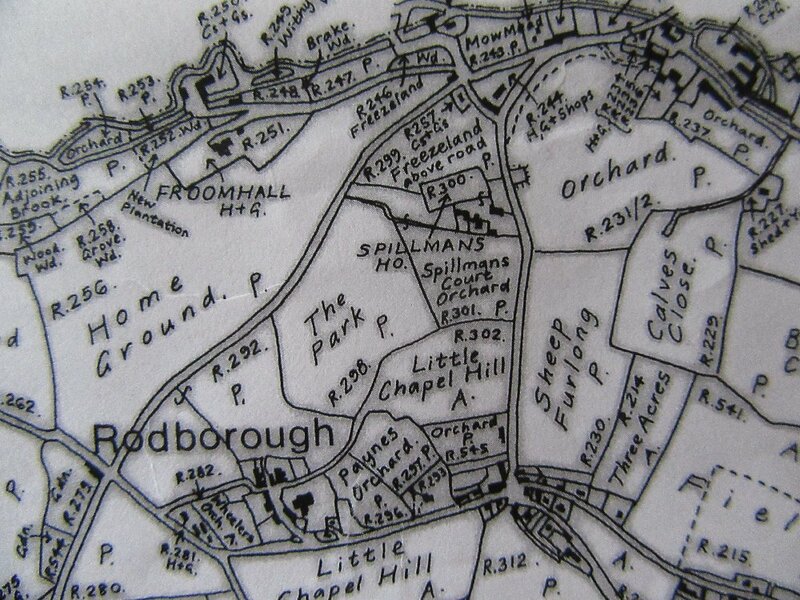 “….when I came to live in (Rodborough Avenue) in 1939, the remains of a substantial part of Spillman’s Court were still there. Part of it was in ruins but much of it was still standing firmly enough for a local furniture removals man to to be able to store much of the property which, in those uncertain times, his clients had left in his care. This then may account for the stories of ghosts! 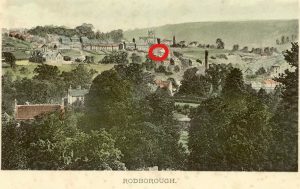 The following postcards from the turn of the century show the distant gable end of the house.